Stores reference 22c/749. Size 6. 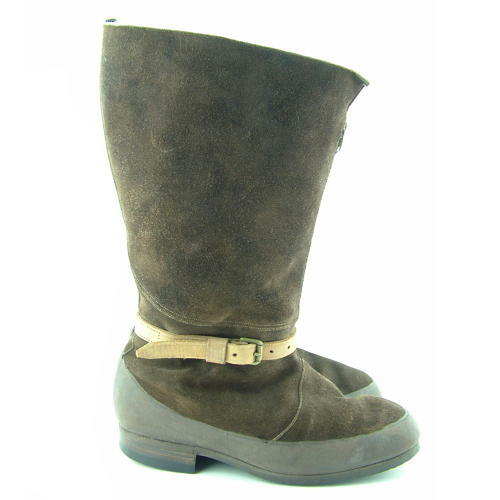 The brown suede uppers are in excellent overall condition and really quite clean with minor marking and rubbing only. The rubber 'galosh' section is complete and flexible on both boots. The heel sections are quite rigid but this is completely normal and exactly as they were manufactured. Excellent 'Lightning' zips. The original 'Itshide' soles and 'Harefoot' heels are very good and display only light wear. The ankle straps are very good as are both brass buckles. The fleece linings are equally good. Complete with insoles (worn). War Deaprtment broad arrow, reference, size and A.I.D. stamps on the zip tongues. These are partially unstitched in both boots (possibly deliberately as they are the same. Although issued these boots have evidently seen little use. A very good pair. Stock code B19713.